Yesterday was one of those perfect evenings where everything comes together. It started off on Gopa Hill where I found a cracking male Blackcap singing from the trees around the old ruined farmhouse, my first for that area. Sitting nearby were a pair of Bullfinches while the air was filled with the sound of Chiffchaffs and Willow Warblers. A few steps further on and a Jay slipped by unusually silently for a bird that normally likes to make its presence known. As I neared Bryn-bach-Common I thought I heard a distinctive call from the valley below so stopped to listen. After a few seconds silence I heard it again and there was no doubt; a Cuckoo was back in the Cwm Dulais valley. I scanned the area intently but with so many potential perches it was always going to be a pretty much impossible task to locate it. 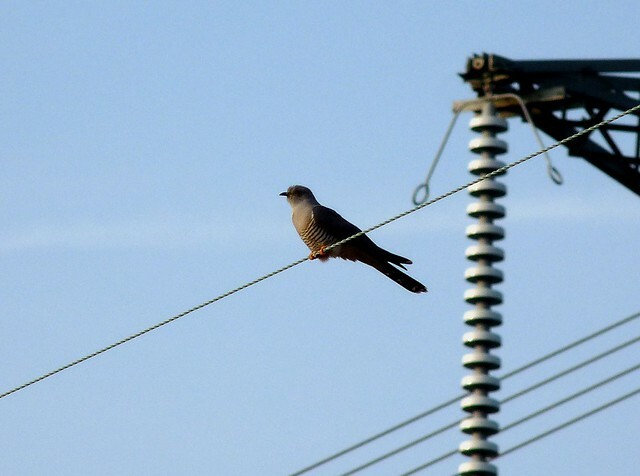 With the Cuckoo still echoing around the hills I turned towards the common just in time to see a largish bird fly up from the ground and land on the telegraph wire normally frequented by the Yellowhammers. I almost couldn't bring myself to hope that it was what I thought it was as a I raised my binoculars for a better look. Sure enough I found myself looking at a superb male Cuckoo and its usual entourage of Meadow Pipits. This was by far the best view I have ever had of a Cuckoo and I was able to watch it for a good hour as it roamed widely across the grassland. The majority of its time was spent calling from the various poles and wires, but on occasion it did land on the ground. This was presumably to find food as I saw it return to its perch with a large caterpillar at least once. The Cuckoo did disappear into the valley a couple of times which made me wonder if this was the same bird that I had originally heard calling or another individual. The answer wasn't long coming as not one but two male Cuckoos flew right overhead. One of the males carried on out of view in the direction of Felindre whilst the other resumed its previous activities on the common. A territorial dispute maybe? Whatever the reason I felt amazingly privileged to have enjoyed such amazing views of these charismatic birds. The Cuckoo's weren't the only new arrivals on Bryn-bach-Common. One male and three female Wheatears quadrupled this years count for the species, and it was also very nice to find a male and female pair of Stonechats. The Swallows from last week were still feeding over the nearby farmland and another four Bullfinch gave a very decent count for the day. The more usual species were also out in good numbers including Dunnock, Blackbird, Pied Wagtail, Magpie, Rook and Carrion Crow, all against the backdrop of almost continuous Linnet movements. There was also a good number of Butterflies on offer including Yellow-tip, Speckled Wood and Red Admiral. We usually reckon we have to be on Skye to hear the Cuckoo! These photos are amazing ... and I see the telegraph wires have had their uses again, Adam! I'm exactly the same Caroline. Usually I only get to see and hear Cuckoos on Mull but these are right by my house which is superb. The lines really are popular as last night a Yellowhammer was sat in exactly the same place as the Cuckoo was in these photos. A fine list of birds Adam, but the star has to be the Cuckoo. I heard my first one of the year on Tuesday. Such a shame that they are in serious decline. Imagine a spring, without that charismatic sound. Not heard one yet this year. Just checked and last years arrived on my patch on the 24th so this weekend I will be listening/looking for Cuckoos. Bravo for the Cuckoo sighting---Its a real beauty!! Keith - It really is a shame. I hope their population can recover before we lose such an iconic bird. Sondra - Thanks very much. Glad to hear about the Yellowhammer, too ... Still can't get over the Cuckoo! 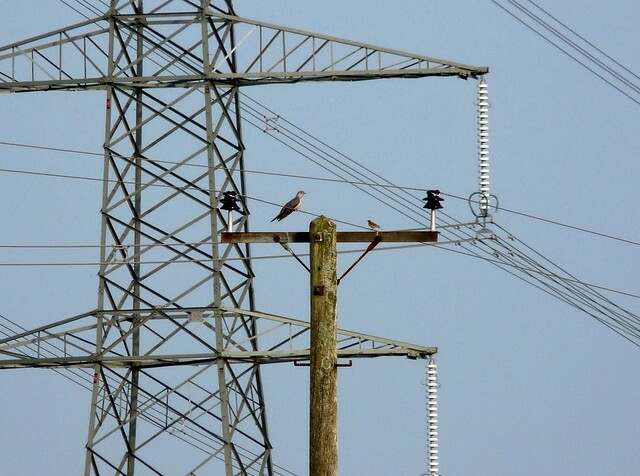 Brilliant cuckoo sighting, so jealous. Mumbles Pier Kittiwakes - They're back!